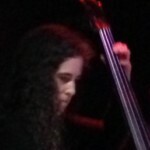 I graduated from Indiana University, Bloomington with a Double Bass Performance degree in 2000. After graduation, I became a member of the “freeway philharmonic” and played with Columbus Symphony and many smaller orchestras in Ohio, West Virginia, and Indiana. My experience includes orchestra, chamber music, solos, choral accompaniment, pit work of all types, church music of all types, bluegrass, Jazz, conducting, arranging, and teaching. I adore that music constantly puts me in a position to grow and learn as a person and artist. My hope is that music can bring joy to those listening and make life more beautiful and rich. Life is difficult and unfair, but it is also fantastic! Music and the arts are part of the fantastic, and I love that I can be a part of that tapestry. At the very first lesson I ask the student what THEIR goals are. What is the student hoping to get out of the lessons? I gear my teaching towards those goals. When a student signs up with me I am not only teacher for 30-60 minutes a week, I am also a mentor. I encourage my students to call/text/email me with any questions they may have in between lessons! I have students that have gone on to win large scholarships to major/minor in music.